"Rocky VII" and "Rocky 7" redirect here. For the third album by 't Hof van Commerce, see Rocky 7 (album). This article is about the 2015 film. For the film series, see Rocky (film series). For other uses, see Creed (disambiguation). Creed is a 2015 American sports drama film directed by Ryan Coogler and written by Coogler and Aaron Covington. Both a spin-off and sequel in the Rocky film series, the film originally starred Joshua Lee but later was replaced by Michael B. Jordan who played as Adonis Johnson Creed, Apollo Creed's son, with Sylvester Stallone reprising the role of Rocky Balboa. It also features Tessa Thompson, Phylicia Rashad, Tony Bellew and Graham McTavish. The film reunites Jordan with Fruitvale Station writer-director Coogler, as well as Wood Harris, with whom Jordan had worked on The Wire. Filming began in Liverpool on January 19, 2015, and later also took place in Philadelphia, Rocky's hometown. Creed was released in the United States on November 25, 2015, the 40th anniversary of the date of the opening scene in 1976's Rocky. The seventh installment of the series and sequel to 2006's Rocky Balboa, the film received acclaim from critics, who called it the best Rocky film in many years, and was chosen by National Board of Review as one of the top ten films of 2015. For his performance, Stallone was nominated for the Academy Award for Best Supporting Actor, his first Oscar nomination since the original film. He also won the National Board of Review Award for Best Supporting Actor, Critics' Choice Award for Best Supporting Actor and Golden Globe Award for Best Supporting Actor in a Motion Picture. A sequel, titled Creed II, was released in November 2018, directed by Steven Caple Jr. In 1998, Adonis "Donnie" Johnson, the son of an extramarital lover of former heavyweight champion Apollo Creed, is serving time in a Los Angeles youth detention center when Creed's widow, Mary Anne, visits and offers to take him in. In 2015, Donnie resigns from the Smith Boardley Financial Group to pursue his dream of becoming a professional boxer. Mary Anne vehemently opposes his aspiration, remembering how her husband was killed in the ring by Ivan Drago thirty years ago. [a] Donnie auditions at Los Angeles' elite Delphi Boxing Academy, managed by family friend Tony "Little Duke" Evers Jr., the son of Apollo's trainer Tony "Duke" Evers, but is turned down. Undaunted, Donnie travels to Philadelphia in hopes of getting in touch with his father's old friend and rival, former heavyweight champion, Rocky Balboa. Donnie meets Rocky at Rocky's Italian restaurant, Adrian's, named in honor of his deceased wife, and asks Rocky to become his trainer. Rocky is reluctant to return to boxing, having already made a one-off comeback[b] at a very advanced age despite having suffered brain trauma[c] during his career as a fighter. However, he eventually agrees. Donnie asks him about the "secret third fight" between him and Apollo just after Apollo helped Rocky regain the heavyweight title,[d] and Rocky reveals that Apollo won. Donnie trains at the Front Street Gym, with several of Rocky's longtime friends as cornermen. He also finds a love interest in Bianca, an up-and-coming singer and songwriter. Donnie, now known as "Hollywood Donnie", defeats a local fighter, and word gets out that he is Creed's illegitimate son. Rocky receives a call from the handlers of world light heavyweight champion "Pretty" Ricky Conlan, who is being forced into retirement by an impending prison term. He offers to make Donnie his final challenger—provided that he change his name to Adonis Creed. Donnie balks at first, wanting to forge his own legacy. However, he eventually agrees. While helping Donnie train, Rocky learns he has non-Hodgkin's lymphoma. He is unwilling to undergo chemotherapy, remembering that it was not enough to save Adrian when she had ovarian cancer. His diagnosis and the fact that his best friend and brother-in-law Paulie Pennino—Adrian's brother—has now died in addition to Adrian, Apollo, and his old trainer, Mickey Goldmill, further force him to confront his own mortality. Seeing Rocky shaken, Donnie urges him to seek treatment. Donnie fights Conlan at Goodison Park in Conlan's hometown of Liverpool, and many parallels emerge between the bout that ensues and Apollo and Rocky's first fight[e] forty years earlier. First, before entering the ring, Donnie receives a present from Mary Anne — new American flag trunks similar to the ones Apollo and later Rocky wore. Additionally, to the surprise of nearly everyone, Donnie gives Conlan all he can handle. Conlan knocks Donnie down, but Donnie recovers to knock Conlan down for the first time in his career. Donnie goes the distance, but Conlan wins on a split decision (just as Apollo retained his title by split decision against Rocky). However, Donnie has won the respect of Conlan and the crowd; as Max Kellerman puts it while calling the fight for HBO, "Conlan won the fight, but Creed won the night." Conlan tells Donnie that he is the future of the light heavyweight division. The film ends with Donnie and a frail but improving Rocky climbing the 72 steps outside the entrance of the Philadelphia Museum of Art. Michael B. Jordan as Adonis Creed: An underdog but talented light heavyweight boxer and the son of world heavyweight champion Apollo Creed. He goes by the name Donnie Johnson. Sylvester Stallone as Robert "Rocky" Balboa, Sr.: A two-time world heavyweight champion and Apollo's rival-turned-friend who becomes Adonis' trainer and mentor. He owns and operates an Italian restaurant in Philadelphia named after his deceased wife Adrian (played by Talia Shire in previous films). Tessa Thompson as Bianca: A singer-songwriter who becomes Adonis' love interest. Phylicia Rashad as Mary Anne Creed: Apollo's widow and Adonis' stepmother, who takes in Adonis as a child following the death of Adonis' biological mother. Graham McTavish as Tommy Holiday: Conlan's trainer. Wood Harris as Tony "Little Duke" Evers: One of Danny Wheeler's assistant trainers. His father, Tony Evers Sr. (played by Tony Burton in each preceding Rocky film), was a father figure for Apollo and his trainer/manager when Apollo became world heavyweight champion. He then became one of Rocky's trainers for his rematch against Clubber Lang and after Apollo's death. Anthony Bellew as "Pretty" Ricky Conlan: A highly formidable yet arrogant British boxer and the world light heavyweight champion. Andre Ward as Danny "Stuntman" Wheeler: A light heavyweight boxer. Gabriel Rosado as Leo "The Lion" Sporino: A light heavyweight boxer. Jacob "Stitch" Duran as himself: An esteemed cutman in both boxing and mixed martial arts, who is recruited by Rocky to be in Adonis' corner. He previously portrayed the cutman of Mason "The Line" Dixon (played by Antonio Tarver) in Rocky Balboa. Liev Schreiber voices an HBO 24/7 announcer, while Michael Buffer cameos as himself serving as ring announcer. Other sports media personalities who appear include ESPN's Tony Kornheiser, Michael Wilbon, Hannah Storm, and Max Kellerman, and HBO Sports' boxing announcer Jim Lampley. Archive footage of Carl Weathers' Apollo Creed is used throughout the film. Stallone, Thompson, and Jordan promoting the film atop the Rocky Steps in November 2015. On July 24, 2013, it was announced that MGM had signed on with Fruitvale Station director Ryan Coogler to direct a spin-off of Rocky, a seventh film in the Rocky series, which Coogler would also co-write with Aaron Covington. Sylvester Stallone also worked on the screenplay for the seventh film. The film would focus on a man following in the footsteps of his late father, Apollo Creed, and getting a mentor in the now-retired Rocky Balboa. Michael B. Jordan was set for the role of Creed's son, Adonis Creed, and Stallone was set to reprise his character of Rocky. Original producers Irwin Winkler and Robert Chartoff would produce, along with Stallone and Kevin King-Templeton. On April 25, 2014, while talking to THR, Coogler stated that he had sent his latest draft to the studio, and confirmed the involvement of Jordan and Stallone. On November 10, real-life boxers Tony Bellew and Andre Ward joined the film, with Bellew to play a fighter, "Pretty" Ricky Conlan, the main opponent for Creed. Shooting was set to begin in January 2015, in Las Vegas and Philadelphia. On December 16, Tessa Thompson was added to the cast as the female lead. On January 8, 2015, Phylicia Rashad reportedly joined the film to play Mary Anne Creed, Apollo's widow. Sylvia Meals, who portrayed Mrs. Creed in Rocky II and Rocky IV had died in 2011. On January 21, Graham McTavish tweeted about his involvement in the film. Principal photography began on January 19, 2015 on location at Goodison Park, with the first scene shot taking place during a Barclays Premier League football match between Everton (of which Stallone and native Evertonian Bellew are fans) and West Bromwich Albion. Goodison would later host both the climactic film fight between Donnie and Conlan and also Bellew's real-life title fight against Ilunga Makabu in May 2016, which was the first outdoor boxing match in Liverpool since 1949. Filming also took place in Philadelphia. In early February, an empty store in Philadelphia was converted into a boxing gym, where some training scenes were shot. On February 13, the crew was spotted filming in the Victor Cafe in South Philadelphia. The cafe was transformed into the "Adrian's Restaurant", and crew were again spotted filming there on February 16. Stallone and Jordan were also spotted on the set of the film on February 18. From February 24–27 and then on March 3, filming took place at Sun Center Studios in Aston Township. The musical score for Creed was written by Swedish composer Ludwig Göransson, who is only the third composer in the history of the Rocky series, following Bill Conti (Rocky, II, III, V, and Balboa) and Vince DiCola (Rocky IV). Creed also features a soundtrack that consists mostly of music new to the series, including hip hop tracks by artists such as Future, Meek Mill, and White Dave. Both a score and a soundtrack album were released on November 20, 2015 by WaterTower Music and Atlantic Records, respectively. One tribute to Conti's original soundtrack is included – the track "You're a Creed" uses both "Gonna Fly Now" and "Going the Distance". On February 3, 2015, Warner Bros. slated the film to be released domestically on November 25, 2015. This date coincides with the 40th anniversary of the opening scene in the original film, where Rocky fights Spider Rico. On December 20, 2015, screeners of numerous prospective awards contenders, including Creed, were uploaded to torrent sites. The FBI has linked the case to co-CEO Andrew Kosove of Alcon Entertainment. Kosove claimed that he had "never seen this DVD", and that "it never touched his hands". Creed grossed $109.8 million in North America and $63.8 million in other territories for a worldwide total of $173.6 million, against a budget of $35 million. 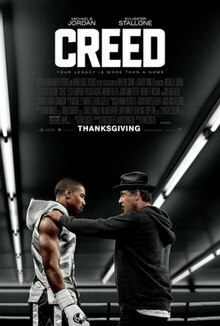 In North America, Creed opened on Wednesday, November 25, 2015, alongside The Good Dinosaur and Victor Frankenstein, as well as the expanding wide releases of Brooklyn, Spotlight and Trumbo. The film was originally projected to gross $35 million from 3,404 theaters in its first five days, including $20 million in its opening weekend. However, after grossing $1.4 million from its Tuesday night previews (a record for a Thanksgiving week release) and $6 million on its opening day, five-day projections were increased to $39–42 million. The film ended up grossing $42.6 million in its first five days, including $30.1 million in its opening weekend, finishing third at the box office. Creed has received critical acclaim. On review aggregator website Rotten Tomatoes, the film holds an approval rating of 95% based on 291 reviews, with an average rating of 7.95/10. The website's critical consensus reads, "Creed brings the Rocky franchise off the mat for a surprisingly effective seventh round that extends the boxer's saga in interesting new directions while staying true to its classic predecessors' roots." On Metacritic, the film has a weighted average score of 82 out of 100, based on 42 critics, indicating "universal acclaim". Audiences polled by CinemaScore gave the film an average grade of "A" on an A+ to F scale, while PostTrak reported filmgoers gave it an overall positive score of 85%. A.V. Wire's Herman Dhaliwal gave the film a very positive review, writing, "I will say the film was everything I could have ever wanted and then some. It's a film that could have gone so wrong in so many ways so easily, but the results show something that is genuine and inspired. It takes the smartest possible routes with the story it wants to tell and delivers in basically every way it needed to. Ryan Coogler cements himself as one of the best rising filmmakers working today, as he crafts an emotional, funny, compelling and uplifting film that is full of strong performances." Andrew Barker of Variety stated that the film lives up to the expectation of its predecessors, while forging its own unique path. He also appreciated the performances of Stallone and Jordan, saying that Stallone deserved credit for taking a chance on young director Coogler, and that his trust had paid off. He concluded that the director "offered a smart, kinetic, exhilaratingly well-crafted piece of mainstream filmmaking". IGN reviewer John Lasser gave the film an 8.5 out of 10, saying, "Creed is a mirror of Rocky's story and we have all been watching that unfold on the big screen for decades. Coogler's film does nothing to break the mold. Rather, it shows that the mold exists for a reason. Jordan delivers a knockout performance, and Stallone does as well. In the end, we can all only hope that we'll get to see Adonis on screen for just as long as we've seen Rocky." In January 2016, Sylvester Stallone and MGM CEO Gary Barber confirmed that a sequel to Creed was in development. That same month, Stallone posed the possibility of seeing Milo Ventimiglia appear in the sequel, reprising his role as Rocky's son Robert Balboa from Rocky Balboa. Ventimiglia previously revealed during the development of Creed that he was open to returning to the franchise, stating, "I'll tell you what, if they invited me, I'd love to be there. If they didn't, I wouldn't be offended." Also that month, it was reported that the sequel's release was tentatively set for November 2017, although it was later pushed back to an unconfirmed date. Development was seemingly delayed by the announcement Coogler had cast Michael B. Jordan in his next film, Marvel's Black Panther, thus delaying production until both men's schedules permitted. A confrontation between Adonis Creed and Ivan Drago was hinted at on Instagram. Stallone later confirmed that he had finished writing the script for the sequel, which would see Dolph Lundgren reprising his role as Ivan Drago from Rocky IV. By October 2017, Stallone stated on his social media page that he would direct the film, however, by December of the same year, Steven Caple Jr. was announced as the director of Creed II. Boxer Florian Munteanu was cast as Drago's son. In an interview on The Ellen DeGeneres Show, Jordan confirmed that Creed II was his next project. ^ As depicted in Rocky IV. ^ As depicted in Rocky Balboa. ^ As depicted in Rocky V.
^ As depicted in Rocky III. ^ As depicted in Rocky. ^ "Creed". British Board of Film Classification. November 20, 2015. Retrieved November 20, 2015. ^ a b c "Creed (2015)". Box Office Mojo. Retrieved March 23, 2016. ^ "2015 Feature Film Study" (PDF). FilmL.A. June 15, 2016. p. 21. Retrieved June 16, 2016. ^ Scott Mendelson (November 25, 2015). "Box Office: 'Creed' Rocks Record-Breaking $1.4M Tuesday, Pixar's 'The Good Dinosaur' Snags $1.3M". Forbes. Retrieved November 29, 2015. ^ Katey Rich (November 18, 2015). "Creed: The Oscar Contender We Should Have Seen Comingf". Vanity Fair. Retrieved November 29, 2015. ^ Josh Terry (November 25, 2015). "REVIEW: 'Creed': half-Rocky sequel, half-Rocky spinoff". The Washington Times. Retrieved November 29, 2015. ^ a b c Kemp, Stuart (April 25, 2014). "Sundance London: Ryan Coogler Talks 'Rocky' Spinoff 'Creed'". The Hollywood Reporter. Retrieved February 2, 2015. ^ a b Yamato, Jen (December 16, 2014). "'Dear White People's Tessa Thompson Lands 'Creed' Lead". Deadline Hollywood. Retrieved December 17, 2014. ^ "Rocky 7's plot is as Stallonian as you'd hoped it'd be". usatoday.com. Retrieved February 25, 2015. ^ a b Sneider, Jeff (January 8, 2015). "Phylicia Rashad to Play Apollo Creed's Widow in 'Rocky' Spinoff 'Creed'". thewrap.com. Retrieved February 2, 2015. ^ a b "Graham McTavish – Twitter". twitter.com. Retrieved February 2, 2015. ^ D'Alessandro, Anthony (June 30, 2015). "'Creed' Trailer: Latest 'Rocky' Sequel Enters The Ring And This One Has Punch". Deadline Hollywood. Retrieved July 1, 2015. ^ a b c "Creed Cast". nytimes.com. ^ a b c Kit, Borys (November 10, 2014). "Boxers Andre Ward and Tony Bellew in Talks to Join MGM's 'Rocky' Spinoff 'Creed'". The Hollywood Reporter. Retrieved February 2, 2015. ^ a b c Fleming Jr, Mike (July 24, 2013). "'Fruitvale Station' Duo Ryan Coogler And Michael B. Jordan Team With Sly Stallone On MGM 'Rocky' Spinoff 'Creed'". Deadline Hollywood. Retrieved February 2, 2015. ^ "CREED Screenwriter Aaron Covington on developing the script & Sylvester Stallone's legacy as ROCKY". Jog Road Productions. December 7, 2015. Retrieved December 15, 2015. ^ Jordan Zakarin (December 29, 2014). "Sylvester Stallone May Have Just Spoiled The Ending of the New 'Rocky' Movie". Yahoo! Movies. Retrieved November 29, 2015. Stallone's apparently making edits to the script, since the tweet's accompanying text read, "Where the screenwriting is done." ^ "BREAKING NEWS re: Creed Movie – Michael B. Jordan and Sylvester Stallones – SPOILER ALERT". phillychitchat.com. Retrieved February 24, 2015. ^ Owen, Luke (January 19, 2015). "Rocky spin-off Creed to shoot tonight at Goodison Park during Everton v West Brom game". flickeringmyth.com. Retrieved January 20, 2015. ^ "Sylvester Stallone: Rocky star delivers message at Everton". bbc.com. January 19, 2015. Retrieved January 20, 2015. ^ Charlton, Corey (January 21, 2015). "Posing with the champ! Tourists get selfie with Sylvester Stallone after running up Philadelphia's 'Rocky' steps". dailymail.co.uk. Retrieved February 5, 2015. ^ "A new 'Rocky' movie is set to begin filming in Philadelphia; Extras needed". onlocationvacations.com. November 25, 2014. Retrieved February 5, 2015. ^ "The new 'Rocky' movie 'Creed' will be filming at a Boxing Gym in Philly this week". onlocationvacations.com. February 2, 2015. Retrieved February 3, 2015. ^ Sullivan, Vince (February 13, 2015). "'Rocky' crew picks Delco gym as movie location". mainlinemedianews.com. Retrieved February 14, 2015. ^ "The new 'Rocky' movie 'Creed' filming at The Victor Cafe in Philly". onlocationvacations.com. February 13, 2015. Retrieved February 14, 2015. ^ "See Philadelphia's Victor Cafe transformed into Adrien's for 'Creed'". onlocationvacations.com. February 16, 2015. Retrieved February 17, 2015. ^ "Sylvester Stallone and Michael B. Jordan on the Creed Set". comingsoon.net. February 18, 2015. Retrieved February 19, 2015. ^ "Filming for the new 'Rocky' movie 'Creed' moves to Aston, PA this week". onlocationvacations.com. February 24, 2015. Retrieved February 25, 2015. ^ "Future, Jhené Aiko, Meek Mill Appear on Newly Released "Creed" Soundtrack". ABC News Radio. American Broadcasting Company. November 20, 2015. Archived from the original on November 23, 2015. Retrieved November 23, 2015. ^ "Creed (2015) – Song Credits". Soundtrack.Net. Archived from the original on November 24, 2015. Retrieved November 24, 2015. ^ "'Point Break' Moved From Summer To Christmas; 'Creed' Coming For Thanksgiving". Deadline Hollywood. February 3, 2015. Retrieved February 4, 2015. ^ Ricker, Thomas (December 24, 2015). "Hollywood's Christmas is being ruined by unprecedented leaks". ^ "Katniss To Sling Arrows Into 'Creed' & 'Victor Frankenstein', As 'Good Dinosaur' Stalks Families: Thanksgiving B.O. Preview". Deadline Hollywood. ^ a b Anthony D'Alessandro. "Katniss Rules Wednesday On Track For $78M-80M 5-Day; 'Good Dinosaur' Eyes $58M-$62M; 'Creed' Punching $39M-$42M". Deadline Hollywood. Retrieved November 26, 2015. ^ "Getting the 'Rocky' spinoff 'Creed' made was a real underdog story for director Ryan Coogler". latimes.com. Retrieved December 2, 2015. ^ "Creed (2015)". Rotten Tomatoes. Fandango Media. Retrieved March 2, 2018. ^ "Creed Reviews". Metacritic. CBS Interactive. Retrieved January 12, 2016. ^ Dhaliwal, Herman. "A.V. Wire Film Review: 'Creed'". Retrieved November 13, 2015. ^ Barker, Andrew (November 18, 2015). "Film Review-Creed". Retrieved November 18, 2015. ^ John Lasser (November 20, 2015). "Creed Review – IGN". IGN. Retrieved November 26, 2015. ^ "Oscar Nomination: The Complete List". msn.com. Retrieved January 14, 2016. ^ "Austin Film Critics Association (AFCA) Nominations – Winners on Page 2". ^ "Mad Max: Fury Road Tops Austin Film Critics Association Awards". ^ "2015 Awards – Austin Film Critics Association". ^ Erik. ""Mad Max: Fury Road" Leads The Race For 2015 CFCA Awards". Archived from the original on December 22, 2015. ^ Nugent, John. "Jameson Empire Awards 2016: Star Wars and Mad Max lead the nominations". Empire. ^ "Golden Globes 2016: See the full list of nominees". ^ "Houston Film Critics Society Nominations". December 13, 2015. ^ scenestealreric (December 16, 2015). "KANSAS CITY FILM CRITICS CIRCLE ANNOUNCES NOMINEES FOR 50TH ANNUAL JAMES LOUTZENHISER AWARDS". ^ "Spotlight sweeps Las Vegas Film Critics Awards". December 17, 2015. ^ "2016 MTV Movie Award Winners: See The Full List". MTV (MTV News). Retrieved April 11, 2016. ^ "NATIONAL BOARD OF REVIEW ANNOUNCES 2015 AWARD WINNERS – National Board of Review". December 1, 2015. ^ "AWARDS FOR 2015 FILMS – National Society of Film Critics Awards". December 1, 2015. ^ "San Francisco Film Critics Circle – Facebook". ^ "2015 – Categories – International Press Academy". ^ "Spotlight Wins Southeastern Film Critics". December 14, 2015. ^ "St. Louis Film Critics Nominations – Kristen Stewart and Abraham Attah Make the Cut". December 14, 2015. ^ Goodman, Jessica (July 31, 2016). "Teen Choice Awards 2016: See the full list of winners". Entertainment Weekly. Time Inc. Retrieved August 1, 2016. ^ "16th Vancouver Film Critics Circle Awards-Nominaciones". Blog de Cine Tomates Verdes Fritos. December 15, 2015. ^ Setoodeh, Ramin (January 5, 2016). "Sylvester Stallone Says 'Creed' Sequel Could Reunite Rocky and Apollo (EXCLUSIVE)". Variety. Retrieved January 5, 2016. ^ Friedman, Roger (January 4, 2016). "Oscar Favorite Sylvester Stallone Says "Creed II" Could Bring Back Rocky's Son". Showbiz 411. Retrieved September 28, 2017. ^ Topel, Fred (August 3, 2013). "Exclusive: Milo Ventimiglia Ready for Creed Comeback". Crave. Retrieved September 28, 2017. ^ "Creed 2 Gets a Tentative November 2017 Release Date". comingsoon.net. Retrieved January 11, 2016. ^ "'Creed 2' Aims to Bring Rocky Back in 2017". movieweb.com. Retrieved January 11, 2016. ^ "'Creed 2' Could Hit Theaters In November 2017, Might Lose Director Ryan Coogler". collider.com. Retrieved January 11, 2016. ^ "'Creed' Sequel Aims for November 2017 Release (EXCLUSIVE)". variety.com. Retrieved January 11, 2016. ^ "Michael B. Jordan Joins Black Panther, Here's What We Know". cinemablend.com. Retrieved June 21, 2017. ^ "Sylvester Stallone Teases an Ivan Drago Angle for 'Creed 2'". ^ "Drago Confirmed for Creed II as Stallone Finishes Script". July 21, 2017. ^ Hall, Jacob (October 9, 2017). "'Creed 2' Will Return Sylvester Stallone to the Director's Chair". /Film. Retrieved December 11, 2017. ^ Kroll, Justin (December 11, 2017). "Steven Caple Jr. to Direct 'Creed 2' Starring Michael B. Jordan and Sylvester Stallone". Variety. Retrieved December 11, 2017. ^ Romano, Nick (January 16, 2018). "Creed 2 casts pro boxer as Ivan Drago's son". Entertainment Weekly. Retrieved January 30, 2018. ^ DeGeneres, Ellen (host) (February 6, 2018). "Michael B. Jordan". Ellen: The Ellen DeGeneres Show. Season 15. Episode 97.